Now that I’m 50, I really appreciate comfy clothes but still want the style of my 21yr old daughter! So I wear a base of black and spruce it up with turquoise jewelry and fabu brown boots by Carlos Santana. 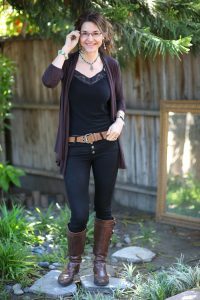 A lacy spaghetti strap top is comfortable but a nice shrug or light sweater keeps the chill of (but if a hot flash comes, off comes the sweater) I love to break up the all black with a vintage all leather belt. It was my mother’s from the 70’s.